Although Facebook is used every day of the week to upload photos and send millions of chat messages through the website and the company’s various mobile apps for different platforms, there are still things that users simply don’t like about the service which Facebook offers. Although it isn’t brand new, one feature that seems to irk a lot of people is the read receipt status indicator that appears in Facebook Messages that shows when a message has been read, or otherwise commonly known as “seen”. If that bothers you, then it’s now possible to install a simple browser extension to disable the feature when using Facebook chat through the website. Chat Undetected is a lightweight browser extension that lets users disable the read receipt / seen feature through Messages on the Facebook website, effectively allowing us to chat undetected, so our friends and connections can’t actually see when we have read one of their messages. Follow the simple steps below to get this little extension installed and begin enjoying undetected Facebook conversations. Note: This step-by-step process has taken place using the Google Chrome browser. Steps may vary depending on the browser used and how that particular browser allows users to configure third-party extensions. 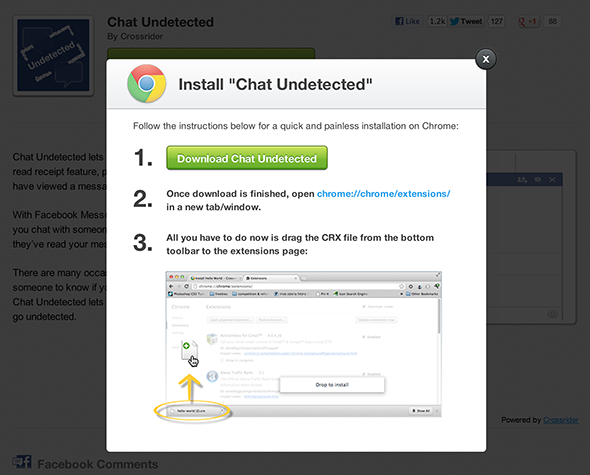 Step 1: Head on over to the Chat Undetected download page and select the Get Chat Undetected button at the top of the page. Step 2: The next stage will involve recognizing the browser in use and provide a download page relevant to that particular browser. Select the Download Chat Undetected button from the top of the page and wait for the extension file to finish downloading. Step 3: In a new instance of the Chrome browser, navigate to chrome://chrome/extensions/ and drag the downloaded CRX file into the browser window. Drop to install. Step 4: Voila. 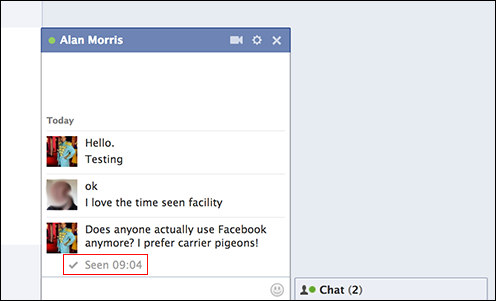 Private Facebook Messages should be a go, with no read receipts popping up when a message is read. I am pretty sure there are plenty of other things which users would choose to change about Facebook and their service before removing a relatively simple and unobtrusive feature such as the read receipt function in the messenger section. With that said, there are a number of reasons why people would want their read status to remain anonymous, so this should definitely help them achieve that.